COUNTY NOVICE SHIELD Asdee 1-8 Renard 0-9 Played at Blennerville on Sunday morning last in difficult weather conditions this was result beyond everybodys expectations as St. Marys Asdee got through by a two point margin in defeating a fancied Renard team who were firm favourites going into this game but a never say die Asdee side even though struggling towards the end of the contest; showed wonderful determination against all the odds with Eoin Kennedy, Mike Breen and Micheal Walsh scoring late points to set up a County Novice Shield Final against old rivals and fellow parishioners Ballylongford in what is sure to be a cracking encounter. Certainly this is a huge boast for the club who have been struggling in the County League all year but in fairness they left that indifferent form behind them on this occasion as they set about their business in fine style with a wonderful goal from Eoin Kennedy who weaved his way past would be tacklers to finish in style to the net inside the opening quarter. This set the tone for the remainder of the half playing with a stiffish wind they had the better of the exchanges and even though Renard wasted a few scoring opportunities but with points from John Doran, Eoin Kennedy and Darren Russell Asdee were to hold the interval advantage; Asdee 1-4 Renard 0-4. On resumptiom Asdee seemed to loose their way for a while but a neat point form Eoin Kennedy who finished the game as top scorer put his side ahead by 4pts. However Renard now with the aid of the breeze shot 4 unanswered points to level up the tie with under 7mts left for play; 1-5 to 0-8. At this stage it looked as if the North Kerry side were in trouble and adding to their woes were to squander 3 close in frees as the South Kerry forged ahead by a point. However with John Doran and Padraig Ruddle now well on top at midfield and Eoin Kennedy causing plenty anxious moments for his marker it was the former Kerry minor star who levelled up the game at 1-6 to 0-9. 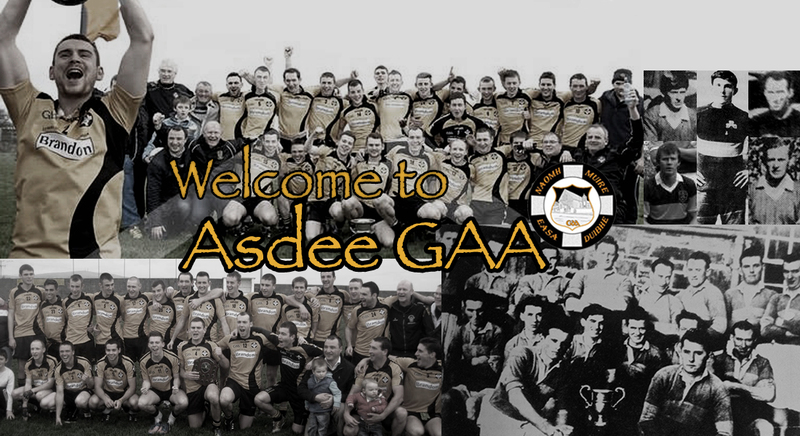 With still plenty to do Asdee showed fierce will to win and fought for every ball as if their lives depended on it and they were rewarded when Micheal Walsh gave his side the lead which was followed in injury time with Mike Breen also splitting the uprights. Still Renard didn’t give up and only for a timely interception by Sean Keane which resulted in a free out for Asdee and there was time for no more as Asdee set up a date with Ballylongford in what is sure to be a much talked about game out North Kerry way. Even though there was plenty individual performances from the team this can only be described as a magnificent team display. Team and scorers; Conor Coughlan, Eoin O Carroll, Martin Collins, Thomas Mulvihill, Con Carmody, Sean Keane, Kieran Kelly, John Doran, 1pt, Padraig Ruddle, Michael Tydings, Eoin Kennedy, 1-4, Micheal Walsh, 1pt, Mike Breen, 2pts, Darren Russell, Brian Coughlan. Subs; Eoin Tydings for Brian Coughlan, Charles Dalton for Michael Tydings, David O Connor for Con Carmody. Dinny Dalton, Padraig Buckley, Brian O Donoghue.